The second half of the twentieth century saw the increasing deregulation of radio, which led to the growth of radio conglomerates across the nation. In response to the disappearance of local voice, grassroots organizations lobbied for communities to gain access to local airwaves. Their decades-long effort led the federal government to create a new class of radio stations called LPFM, signed into law in 2010. With a cap of 100 watts, Low Power FM stations have a radius of 3 miles, perfect for a small town like Denton. In 2013, the FCC accepted applications for new LPFMs, a rare opportunity unlikely to happen again. TWO YEARS LATER, we were granted permission by the FCC to take on KUZU 92.9FM, set to launch in 2017. We see KUZU as a public forum for artistic expression, music, debate, and local affairs. With the help and support of the community at large, we hope to make KUZU Denton’s own radio station for generations to come. Real Waves Radio Network, Inc. is a non-profit corporation and shall be operated exclusively for educational and charitable purposes within the meaning of Section 501(c)(3) of the Internal Revenue Code of 1986, or the corresponding section of any future Federal tax code. Real Waves Radio Network’s purpose is to operate a non-commercial, non-sectarian, low power frequency modulation community radio station. Real Waves Radio Network meets this purpose by broadcasting terrestrially and digitally to provide a designated public arena for artistic expression, music, debate, discussion, announcements, and other public affairs and services. To maximize our impact on current efforts, we may seek to collaborate with other non-profit organizations which fall under the 501(c)(3) section of the internal revenue code. KUZU will not accept or air programming that incites hatred against, or serious contempt for, or severe ridicule of, any person or group of persons because of age, ethnicity, nationality, race, gender, sexual preferences, religion, transgender status, or disability. Weeks, Jerome. "Making Waves On The Air In Denton" KERA Public Media. 21 July 2018. Granados, Mateo. "Photoset : KUZU Dimensions" The Dentonite. 12 Feb. 2018. Web. Carter, Steve. "Radio, Radio!" Patron. 29 Nov. 2017. McDonald, Mazy. "New community radio station transmits Denton’s diversity to airwaves." North Texas Daily. 2 Sept. 2017. Web. 11 Nov. 2017. MALLORY FRENZA. "DENTON JUKEBOX: KUZU Producer Edition." The Dentonite. 9 Oct. 2017. Web 19 July 2018. Knecht, Lyndsay. "A Week in the Life of KUZU 92.9, Denton’s New Radio Station." D Magazine. 2 Aug. 2017. Web. 16 Sept. 2017. Arauz, Pablo. "Spirit of Radio: KUZU Launches in Denton." The Dallas Observer. 25 July 2017. Web. 19 July 2018. Wedding, Paul. "BIRTH OF A STATION: DENTON’S KUZU FINALLY LAUNCHES." Central Track. 25 July 2017. Web. 16 Sept. 2017. Button, Sara. "KUZU Finally Has a Launch Date." The Dentonite. 21 July 2017. Web. 19 July 2018. Button, Sara. "KUZU Signs a New Lease." The Dentonite. 23 Jan. 2017. Web 18 July 2018. Payne, Matt. "Now on air, KUZU keen to turn up the volume." Denton Record Chronicle. 22 July 2016. Dentonrc. Web. 16 Sept. 2017. Button, Sara. "KUZU is Fully Funded & Set to Launch 24/7 in July." The Dentonite. 9 May 2016. Web 18 July 2018. Saeed, Sadia. "KUZUthon a communal effort to empower local radio station." North Texas Daily. 28 Apr. 2016. Web. 16 Sept. 2017. Arauz, Pablo. "Denton Gets a New Radio Station, KUZU 92.9 FM, Thanks to Music Scene Vets." Dallas Observer. 6 Apr. 2016. Dallas Observer. Web. 16 Sept. 2017. Button, Sara. 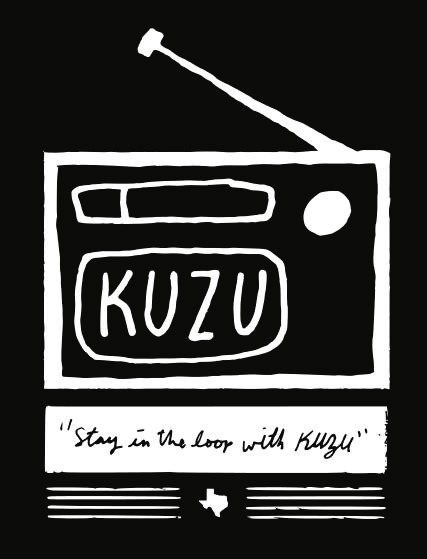 "KUZU Brings Denton's First LPFM Radio Station." The Dentonite. 8 Mar. 2016. 16 Sept. 2017.